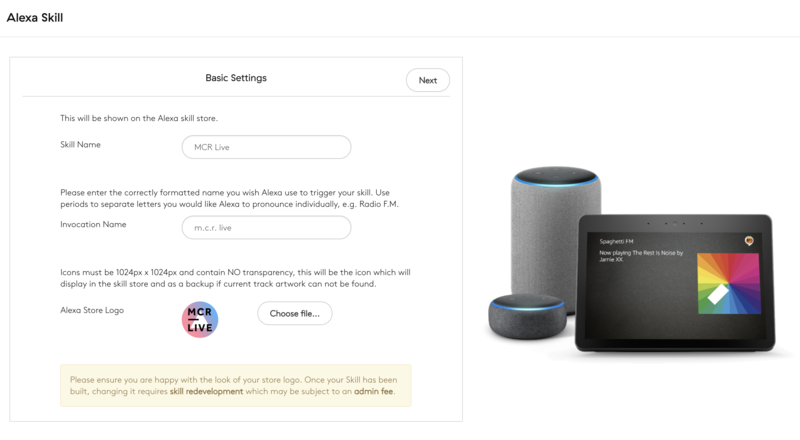 Set up your Alexa skill so your station can be heard on Amazon smart speakers and other supported devices. The following information is required to create a skill. Without this information we would be unable to proceed and may cause a delay in delivering your station to the Skill Store. English, Japanese, Spanish, German, French. Please ensure any text you provide for your skill (invocation name, description etc) is in your chosen language. We cannot develop skills with any other languages at this time until Amazon provide support. Store Listing Icon - 1024x1024px JPEG or PNG. This cannot be changed once your skill has been created. Website - Your station must have a functioning website to use this service. 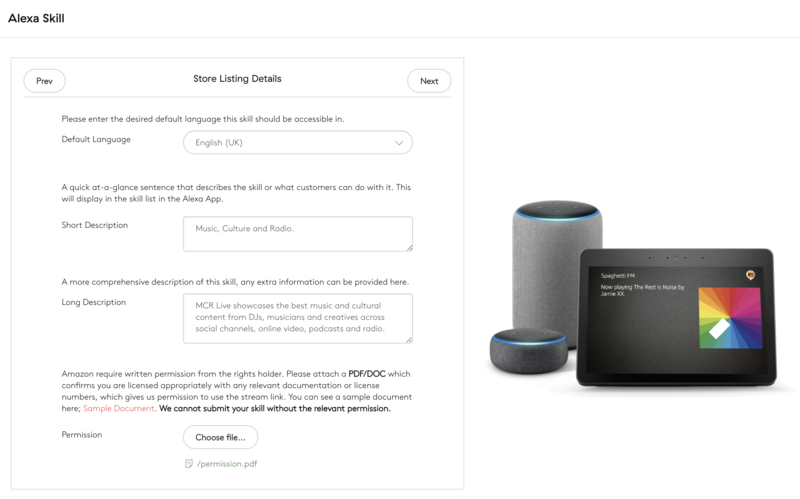 Permission document - This is required by Amazon to confirm you have agreed for Radio.co to submit your station to the Skill Store. It MUST be provided on headed letter paper including your station name, logo, address, your name, signature, position at the station. You can find a template for this document template here. Log in to your Radio.co Dashboard then head to Add-ons in the sidebar. Click the Get Started button under 'Alexa Skill'. Skill Name - This is what's displayed in the Alexa Skill store on Amazon.com, within the Alexa App, and on an Echo device with a screen. - Invocation names must be longer than one word. - If your station name includes numbers, these must be spelled out (e.g. 'Hot 97 FM' must be entered as hot ninety seven f. m. ). 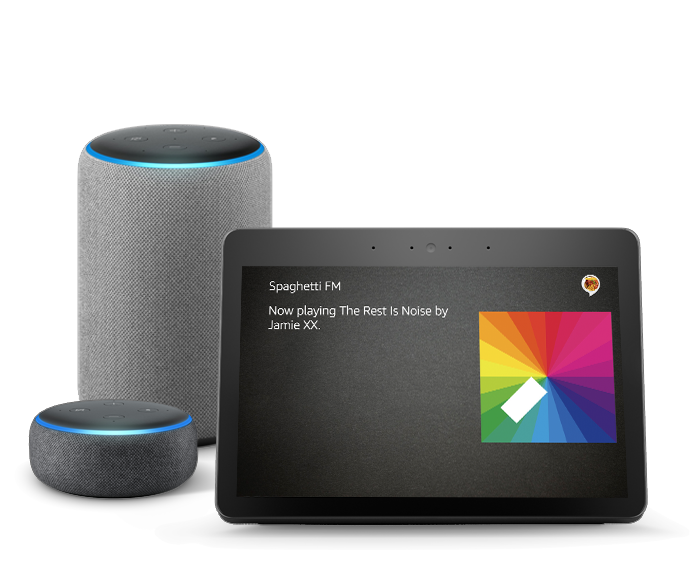 Alexa Store Logo - This is displayed on Amazon.com, the Alexa App and on Echo devices with a screen. It must be 1024x1024px in either PNG or JPEG format. Default Language - This is the language you want your skill to be available in. It will be available in the Alexa Skill Stores which support your chosen language. Short Description - This should be a short sentence / subtitle briefly describing your Skill. No more than 140 characters. 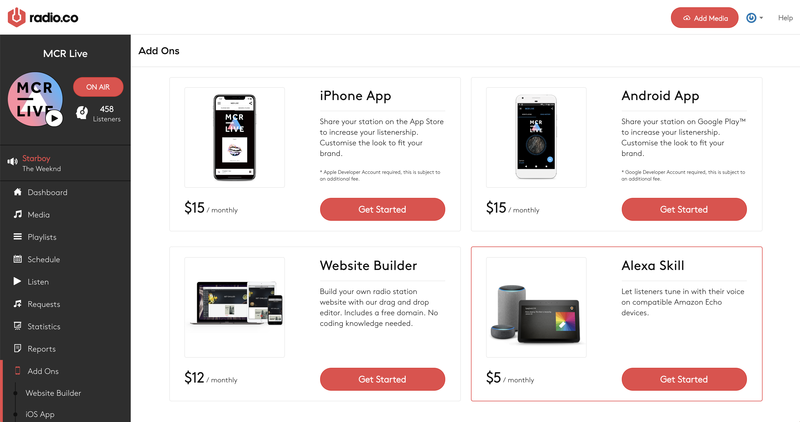 Long Description - This will be displayed on your Skills page within the Alexa App and on Amazon.com. No more than 4000 characters. Permission Document - This can be uploaded as an image or PDF. Note: This option can be edited at any time, even when your skill has been developed. Announcement - When someone opens your App, have alexa announce your stream. 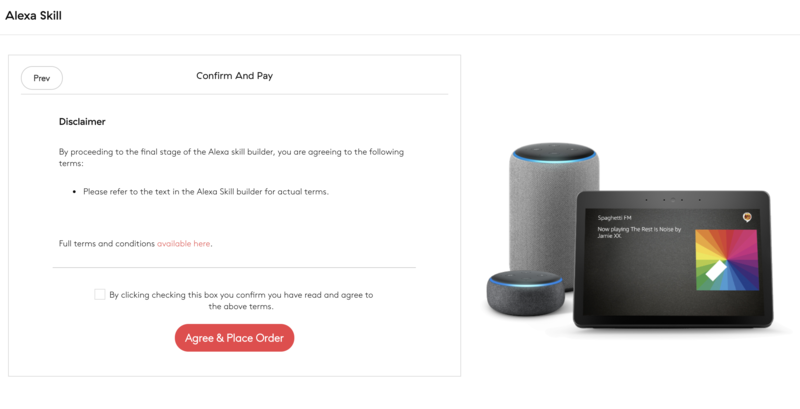 Please familiarise yourself with the terms of service for alexa, agree by checking the box and click the Place Order button. This will charge your payment method immediately and pass your skill forward for review. Your Skill will be submitted to the development team for review. If there are any issues with your submission they will contact you via email. Skills submitted to the store are subject to Amazon Review. If they find any issues with your Skill, availability may be delayed. Once your Skill is live we will confirm via email, providing your link so you can direct listeners to install it on their devices.